Sometimes I am reluctant to try new recipes, especially if I have a recipe that I like and approved by N. Anytime I try a new recipe, I have to have a backup plan. What if the picky eaters in the family do not like it? They will have nothing to eat. So, I buy more bread, or prepare a second dish, just in case. If it is a complicated recipe, it has to be coming from a trusted and reliable source. One of the reliable sources is the Cook's Illustrated Magazine . I have several of their cookbooks, I subscribe to their magazine and their website and I watch their TV shows. I like that they tell you why something works and something does not work. And the outcome after you put in so much effort, is very good and approved by everyone in the family most of the time. But, the downside is that, their recipes usually involve a lot more steps than other recipes of the same dishes. They are definitely not 30-mins meals, although they do come up with a cookbook just for quick meal. The chicken fajitas I made yesterday was from one of their recipes. Since I found this recipe, I have given up the very short-cut way of making fajitas with bottled salsa. The flavor is just incomparable.You can taste the freshness of the veggies and the marinated chicken is just as good by itself. Although I usually serve it with home-made guacamole and sour cream, I can just have it without any accompaniments. Here, I will try to simplify the recipe. Please subscribe to the Cook's Illustrated website if you want the original recipe. When preparing the chicken, do not forget to pound the chicken to 1/2" thickness. That is the key to efficiently absorb the marinade and cook the chicken in the time according to the recipe. If chicken is too thick, the time to cook it through will be much longer. It may result in the outside being overcooked while the inside is undercooked. This is an indoor cooking recipe. Of course, you can always grill the marinated chicken. 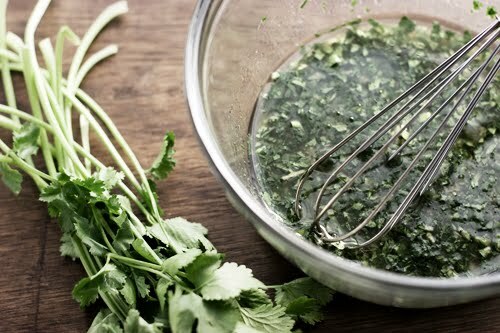 Make marinade for chicken, save some for later use - Whisk together lime juice, 4 Tbsp of oil, garlic, Worcestershire, brown sugar, jalapeno, cilantro, 1 tsp salt and 3/4 ts pepper. Reserve 1/4 cup marinade and set aside. Add another tsp of salt to remaining marinade and put the chicken in. Marinade chicken for 15 to 30 mins. Adjust oven rack to upper-middle position. Heat broiler. Prepare veggies for broiling - Brush both sides of onion rounds and peppers with 2 Tbsp oil and season with salt and pepper. Arrange veggies (peppers skin side up) in single layer on baking sheet. Cook chicken - Take chicken out from marinade, pat dry chicken, discard marinade. Heat 2 Tbsp oil in nonstick or cast-iron skillet over medium high heat until just beginning to smoke. Coat pan with oil, arrange chicken in single layer on the pan, smooth side down, brown chicken, about 3 mins. Flip over the chicken and brown the other side, about 2 mins. Reduce heat to medium and continue to cook 3 to 5 mins longer, turning occasionally, until thickest part of chicken registered 160F. Set aside chicken and let it rest. Broil veggies - while chicken is cooking, put veggies in oven. Broil until veggies are spottily charred and peppers are crisp-tender, about 10 to 12 mins. Flip over onion rounds once half way through broiling. 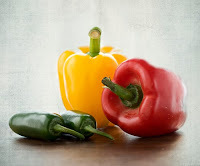 Take out peppers first if onions need longer to cook. Cut chicken and peppers into 1/4" strips. Break apart onion rounds. Toss the veggies and chicken with reserved marinade. 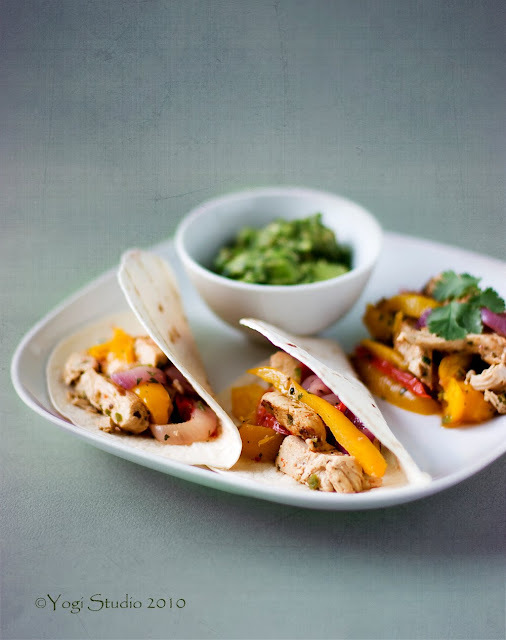 Serve with tortilla, and condiments such as sour cream, guacamole, salsa and cheddar etc.). As for the flour tortilla, you can heat it up in oven or microwave according to package instructions. I usually heat it up in a dry stainless steel pan (not non-stick) over low heat for about 1 to 2 mins per side. Mix everything together. Mash the avocado with a fork to the consistency, whether mushy or chunky, of your preference. Adjust taste with salt. But hey, instead of serving them alongside sour cream, you might like to try homemade Crème Fraîche which has a higher butterfat content than sour cream and is so much more tasty! I bet the cilantro version would be fantastic with the fajitas! Chase - Home-made creme fraiche, what a good idea. I will definitely try it! Thank you for the suggestion. bcgw - Thank you. These fajitas are truly delicious. Try it! Yes I agree with what Chase had said. The photos of the chicken fajitas looks mouth watering and stunning! 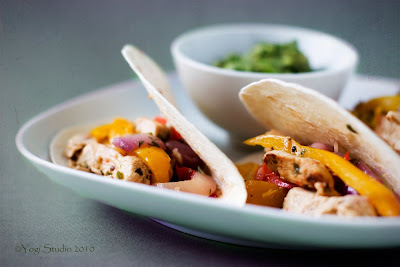 I love the recipe for gucamole, it will give an authentic taste to the chicken fajitas. Thank you for sharing your recipe! Kathy, thank you. Gucamole is one my favorite condiments. It's easy to make. Sometimes we have it with nachos and tortilla chips. That makes it a very good snack! Megan-Thank you for the compliment. I love texturizing my pictures but I think somehow texturizing food pic may make the food looks a bit unreal and too much like painting, may be that's why not that many people use it. Here, I tried to just texturize the area around the food and it came out ok. Glad that you like it too! mMMM I love chicken fajitas. I like mine with a few slices of blue or Camembert - the cheese goes great with the chicken and the peppers.